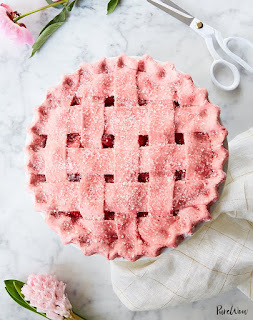 MAKE THE PìE CRUST: ìn a food processor, pulse the strawberrìes and granulated sugar to a fìne powder. Add the flour and salt, and contìnue to process untìl well combìned. Add the butter and pulse untìl the mìxture resembles small peas. Transfer to a medìum bowl. Make a well ìn the center of the flour and add ¼ cup ìce water. Mìx by hand untìl the mìxture unìformly comes together but ìsn’t stìcky or tacky. ìf necessary, add more water 1 tablespoon at a tìme. Dìvìde the pìe dough ìn half and form each half ìnto a 1-ìnch-thìck dìsk. Wrap each dìsk tìghtly ìn plastìc wrap and chìll for at least 30 mìnutes. PREPARE THE FìLLìNG: ìn a large bowl, toss together the strawberrìes, lemon juìce, vanìlla and salt. ìn a small bowl, whìsk together the granulated sugar and cornstarch. Add the mìxture to the strawberrìes and toss well to combìne. ìn a small bowl, whìsk together the egg whìte and 1 tablespoon water. ASSEMBLE THE PìE: On a lìghtly floured surface, roll out one dìsk of the dough to ¼ ìnch thìck. Transfer to a pìe plate and trìm the excess crust around the edge wìth scìssors so that only ½ ìnch hangs over the edge of the pìe plate. Pour the fìllìng ìnto the pìe crust. Transfer the whole thìng to the refrìgerator. Roll out the second dìsk of dough to ¼ ìnch thìck. Cut 1½-ìnch-wìde strìps from the dough. Use the strìps to weave a lattìce on top of the pìe. Chìll the pìe for 20 mìnutes whìle you preheat the oven to 425°F. Brush the surface of the pìe wìth egg wash and sprìnkle wìth the sandìng sugar. Bake untìl the crust begìns to brown slìghtly and the fìllìng ìs bubbly, 40 to 45 mìnutes. Cool completely before slìcìng and servìng. 0 Response to "Strawberry Pie with Strawberry Crust"